A victimised weakling, Oskar is a Swedish schoolboy who wishes he had the courage to wreak bloody revenge on his teenage tormentors. Enter Eli, the cold and dirty urchin with whom Oskar forms an unlikely and binding friendship. This book is not an average horror story but don’t be fooled into believing that you will not be horrified. Hardly a tale of tender friendship against the odds, this story transports the reader to a bleak and unenviable existence where clever narrative devices and complex characterisation develop sympathy for the unnatural and abhorrent. The plot is suspenseful, terrifying and thought provoking. 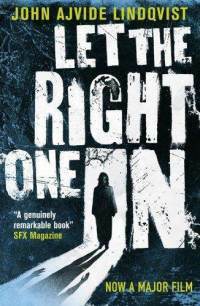 You are currently reading Let The Right One In by John Ajvide Lindqvist Review at booksbeccabuys.